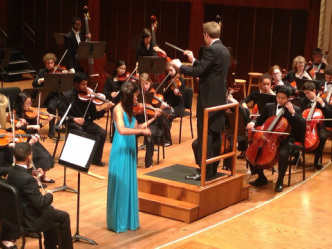 Carmel Violin Studio offers quality private lessons for children and adults. Studio is conveniently located in central Carmel serving north suburban Indianapolis area. Please come and enjoy live performance of 13 young violinists performing various genre of music. The concert is free. Hotdogs and chips will be served. Just bring your lawn chair and relax at the 2nd annual outdoor concert/picnic. Congratulations to Alice for her debut performance at Hilbert Circle Theater. She performed the 1st mov. of Vivaldi's 'Spring' Violin Concerto with New World Philharmonic Orchestra.